Marine mammal experts are testing tissue samples for a potential common cause of the surge in carcasses found on the state's beaches this year. Marine mammal experts are at a loss to explain why a large number of harbor seals have turned up dead on beaches in southern Maine this summer. 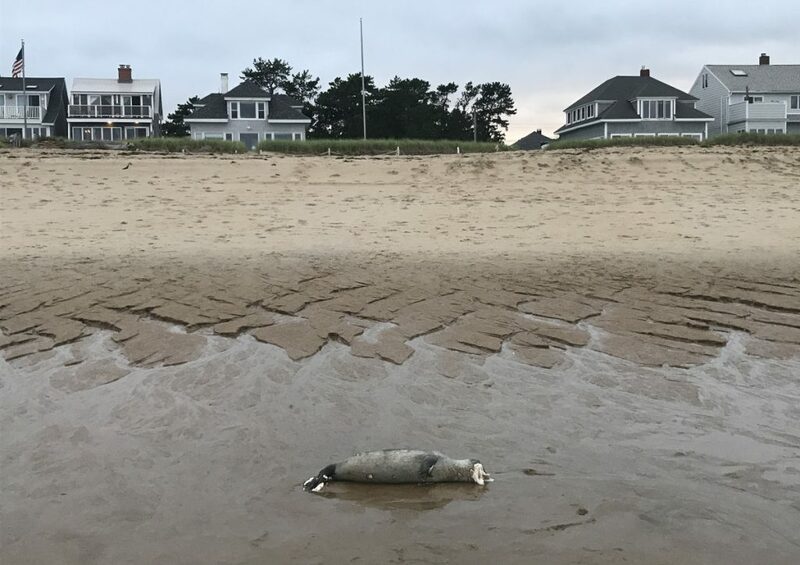 The most recent cluster of deaths was reported Monday when the carcasses of 11 harbor seals, mostly pups, were discovered on Bayview and Kinney Shores beaches in Saco. Those beaches are situated between Ocean Park and Ferry Beach State Park. In the past two days, more than 30 dead harbor seals have washed ashore on southern Maine beaches, including Wells Beach and Ogunquit Beach, said Lynda Doughty, executive director of Marine Mammals of Maine, which investigated the Saco seal deaths. Doughty said her Harpswell-based nonprofit has turned to the National Oceanic and Atmospheric Administration to help determine the cause of the seal deaths in Maine. NOAA is analyzing tissue samples taken from the dead animals. Researchers are in the process of determining how many dead seals have washed ashore in southern Maine this summer, Doughty said Monday. In Saco, the seal carcasses were in various stages of decomposition and their ages varied widely, although most of the animals were pups, Doughty said. “None were really fresh carcasses,” she said, noting that will make it more difficult to determine when the animals died. The seal carcasses found in Saco on Bayview Beach and Kinney Shores, above, were in various stages of decomposition and their ages varied widely, although most of them were pups. The Saco Police Department took the first report of the dead seals around 7:30 a.m. Monday. Lifeguards who arrived at the Bay View and Kinney Shores beaches a short time later found 11 dead seals, said Ryan Sommer, director of Saco Parks and Recreation. The city called the Marine Mammals of Maine, and Sommer said the nonprofit sent a volunteer to Saco to examine, measure and photograph the seals. After the seals were examined, the city’s public works department removed the carcasses from the beach to dispose of them, Sommer said, completing the removals by 2:30 p.m. Historically, about 30 percent of all harbor seal pups born in any given year die that year, Lacasse said. He said the die-off seen in Saco reminded him of a situation that took place on a beach in Rye, New Hampshire, late in September 2011. The aquarium sent a veterinarian to Rye and found the carcasses of six harbor seals. There was a lunar high tide with big surf when the seals washed ashore. A harbor seal carcass washes ashore Sunday on the beach at Kinney Shores in Saco. 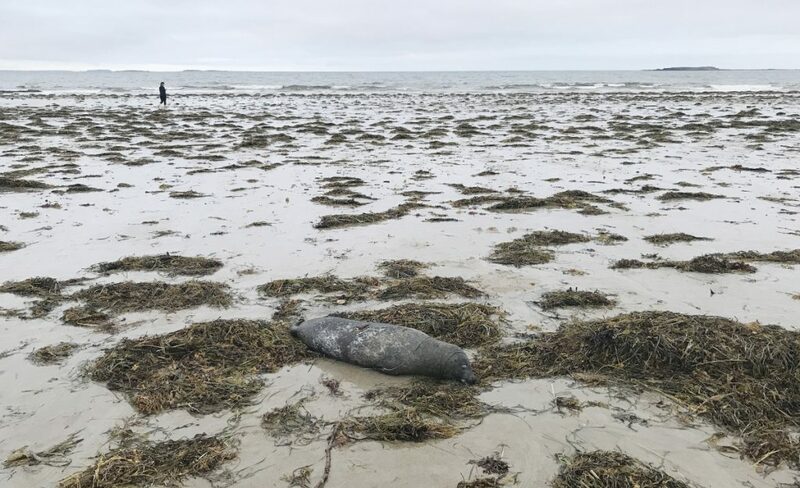 Eleven dead seals were found Monday on Bayview and Kinney Shores beaches, and dead seals also have been reported on Wells Beach and Ogunquit Beach in the past two days. In December 2011, The Associated Press reported that 162 seals had been found dead since Sept. 1 on the coast from northern Massachusetts to Maine. The die-off that year was particularly intense in September and October, when deaths were about three to four times the normal number. Tests conducted on five animals showed they suffered from a bacterial pneumonia caused by a strain of avian influenza – H3N8 – that can be transmitted to seals through contact with seabird guano. Although marine mammal researchers are just beginning their investigation into the recent harbor seal deaths, Lacasse said the cause of the current die-off could be connected to another flu outbreak. Another possibility is a shortage of the fish, shellfish and crustaceans that harbor seals feed on. Harbor seal pups are typically born in May. Their mothers nurse them for about a month, but by the time June and July arrive, the seals are “on their own” and must forage for food, Lacasse said. Harbor seal pups can swim at birth and can dive for up to two minutes when they are only 2 or 3 days old, according to NOAA. Mother harbor seals raise their pups in nurseries that help protect the pups from predators. 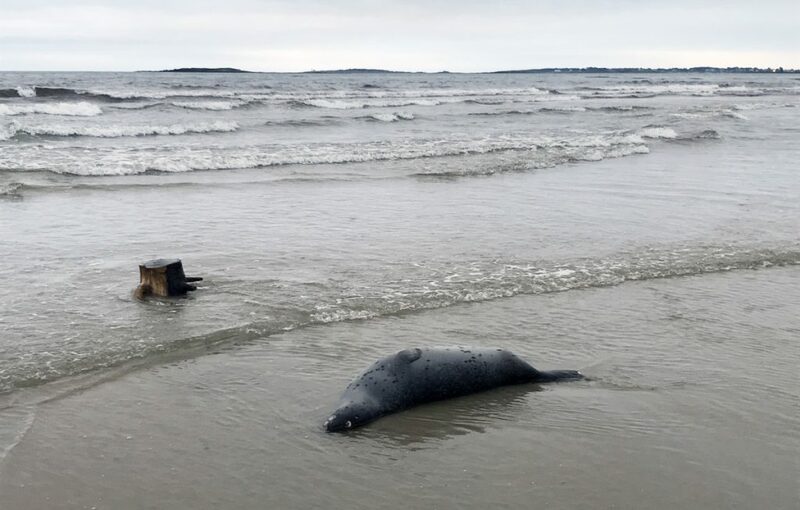 Several whale carcasses have some ashore this summer as well, but Lacasse said he is confident that their deaths are not connected to the seal die-off. Last month, the carcass of a badly decomposed adult minke whale washed up on Old Orchard Beach, about a mile south of the Old Orchard Beach pier. An excavator was used to remove the 5,500-pound whale carcass from the beach. Another dead minke whale washed ashore last month in Cape Neddick. That whale had been dead for several weeks. On July 7, Marine Mammals of Maine responded to the report of a dead juvenile minke whale that washed ashore at Kittery Point. Lacasse doubts the avian flu is what caused the whales to die. “I don’t think so. That would be a big jump (for the virus) to make,” he said.